Irony: representation of oppression auctioned off for a charity called Save the Children. 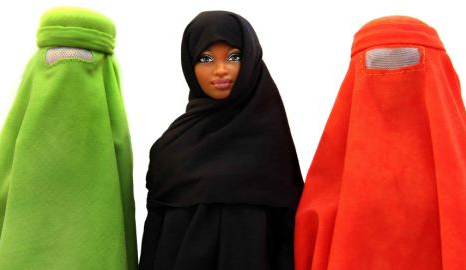 Toy-maker Mattel is backing the auction of the Burka Barbie to raise funds for a children’s charity, saying that the doll shows girls that they “can be whatever they want to be.” If a girl wants to wear a blanket over her head by way of an oppressive, patriarchal hierarchy whose fundamental belief contradicts such a marketing slogan, then so be it. This entry was posted in FAIL, Pop-culture, Religilicious by Dana Loesch. Bookmark the permalink.